It is well and truly spring here in Adelaide and the weather has been beautiful. We have had beautiful spring days. 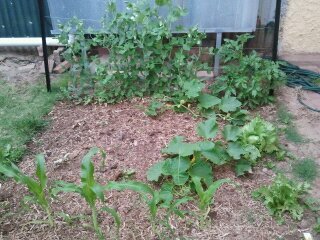 I now feel I need to update you on our vegetable garden. It is growing very well, and I will take some pictures to show you. We have a large quantity of peaches, apricots and pears that are growing on our trees so we are looking forward to some lovely fresh produce in the new year. Our corn (normal corn that is) is growing very tall, so again we hope to have some nice cobs to eat soon. The lawn (couch) that was in the patch before we dug it up for a veggie patch, is also flourishing with the extra watering. So after this crop, we will have to dig it over again. 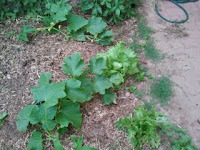 We should have sprayed and let the ground sit for a while, but we were a little impatient to get our veggies growing & dont' like the idea of sprays. 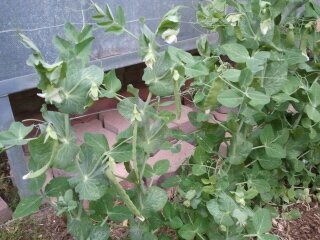 Our snowpeas are just gorgeous and taste yummy. DD #2 who is 4 yo, goes out everyday to pick some & loves eating them straight off the plants. Yesterday she played with her little friend Penelope and they had a wonderful time staying there eating snowpeas for ages. Penelope said they were the best snowpeas she had eaten. Not that imagine the 4 yo is a connisseur of snowpeas, I still felt my chest puff out!! !